A flooded basement is a nightmare! A basement flooded due to sewer or septic backup is the worst nightmare anyone can experience! Not only is it inconvenient, the health risk and property damage are major. At a time like this you need Done Right Carpet Restoration Inc.! We are the professionals who have been there before and know exactly what to do. 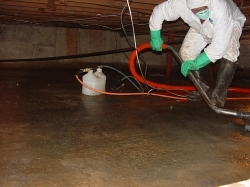 Not only do we have the equipment to remove the sewage, we also have the disinfectants, chemicals, and training to make the affected area safe once more for you and your family. If your sewer or septic system is giving you problems, call Done Right Carpet Restoration Inc. and get it done right!